See our 2 Minute video on YouTube to see how it looks and works. 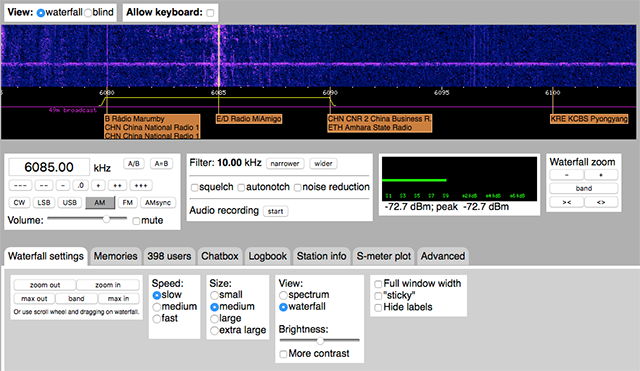 You now have total control over your own Shortwave receiver, right on your sceen! See the signals in the 'waterfall' view, where you can zoom in and out. Feel free to experiment with the many options. You can store your favorite frequencies, narrow or widen the channels for better reception and there's also a live chatbox where you can tell everyone how great it is to listen to Radio Mi Amigo International! The Wide-band WebSDR receiver is located at the amateur radio club ETGD at the University of Twente in the eastern part of the Netherlands. Below is a screenshot of their web page.